During the papal liturgies, Pope Benedict XVI will use a Missal prepared especially for this Apostolic Journey. 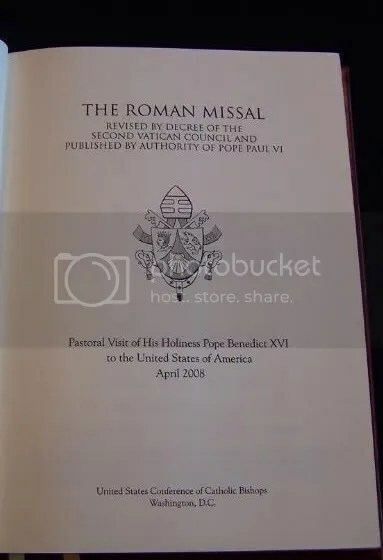 The Missal was prepared by the Office of Liturgical Celebrations of the Supreme Pontiff and the Secretariat for Divine Worship of the United States Conference of Catholic Bishops. It was published by USCCB Publishing. The Missal includes all of the prayer texts the Holy Father will use in celebrating the liturgies. There are two bindings: white and maroon. 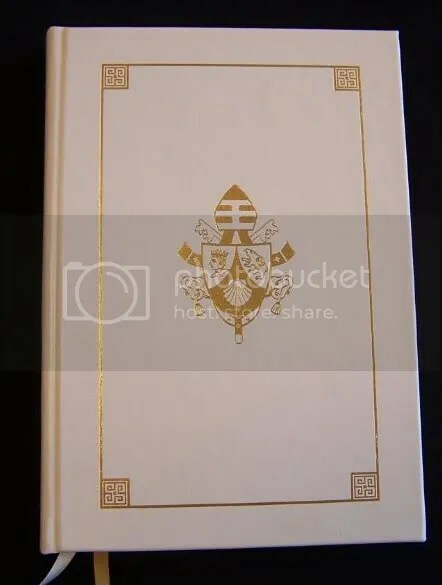 The Holy Father will use the Missal with the white binding. The other binding will be used by the members of the papal entourage and the bishops. Pope Benedict XVI’s coat of arms is on the cover. 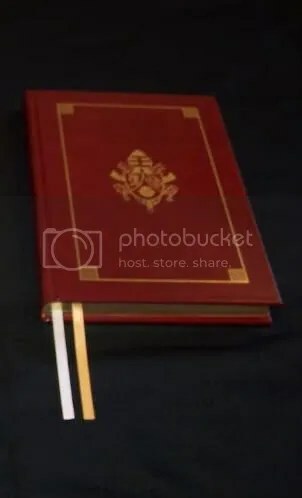 The Holy Father will use the Missal with the white binding. the papal entourage and the bishops. Title page with Pope Benedict XVI’s coat of arms. On April 16 (his 81st birthday), Pope Benedict XVI will meet briefly with representatives of various Catholic charitable foundations. In his first encyclical, Deus Caritas Est, Pope Benedict spoke about the importance of Christian charity and care for the poor in the life of the Church. The Catholic Church is the United States is an important provider of services to those in need. According to The NonProfit Times, the Catholic Charities network is the nation’s fourth largest non-profit. The combined revenue of the Catholic Charities network from all sources, public and private, was $2.69 billion in 2000. Nearly 90 percent of these funds were spent on programs and services, including social support services, services to at-risk populations, food banks, family counseling, mental health services, pregnancy services, adoption services, housing, and disaster relief. In 2006, Catholic Charities USA provided aid to more than 11 million people. In addition, 556 Catholic hospitals provided health care services to more than 84 million patients. Through the USCCB Department of Migration and Refugee Services and its collaborating agencies in the dioceses, the Catholic Church has helped to settle approximately one-third of all refugees admitted to the United States since 1975. The Catholic Legal Immigration Network, Inc. (CLINIC) provides legal services to low-income and indigent immigrants, assisting with matters such as family reunification and asylum. On the international level, Catholic Relief Services (CRS) provides humanitarian relief and development assistance to millions people in over 100 countries around the world. In 2006, CRS provided nearly $600 million in aid. Its projects include disaster relief (including recovery from the 2004 tsunami), AIDS relief, provision of clean water, and agricultural assistance.